Purchasing a new home can be stressful enough, but the stress of relocating all of your belongings under a strict deadline can be overwhelming. As a moving company in Philadelphia PA with years of experience serving our community, below we offer tips that can help you experience a move that is free of injuries and as stress-free as possible. The chances of tripping and falling on an object increase as you get tired, which is easy to do after carrying many heavy boxes and oddly-shaped items that can block one’s view of the ground. Debris and cluttered walkways can be a danger for anyone carrying items or boxes. A serious injury can result from a slip and fall accident. One of the services we offer as a moving company in Philadelphia PA is cleaning homes before and during a move. Call us to find out more. When everyone shows up to help you on moving day, set some ground rules for safety before getting started. By sticking to a set of safety protocols, each party involved should be on the same page about how to stay safe while helping you move your belongings. As an experienced moving company in Philadelphia PA, we understand the importance of safety. All of our moving specialists are trained to follow safety guidelines. Know your restrictions and physical abilities before you make the move to your new home. Do not try to lift and carry boxes that you know are way too heavy for you. Pushing your body to overexertion can be a quick way to injure your back, neck, knees and more. Do not carry more than one box at a time. If a box is too heavy for you to lift, separate items into more boxes. It is better to make additional trips than carrying too much at once. Bring snacks and a variety of drinks for everyone on moving day. Engaging in strenuous activity for too many hours can lead to an injury. Encourage everyone to take breaks when they get tired so they are less likely to hurt themselves. During those breaks, it can be helpful to stretch before moving again to increase flexibility. For particularly hot days, provide lots of cold beverages for everyone to stay hydrated. Move your body in a smarter fashion, not harder. If there is a better way to move an item, take the time to do it safely. If your body doesn’t feel right, stop what you are doing and try another technique. As the saying goes, lift with your legs and not with your back. Lifting heavy objects for hours at a time can put your body through a great amount of stress. Using proper body mechanics can help decrease your chances of pulling a muscle, slipping a disc, or worse. It can be of enormous benefit to use specialized moving equipment to help get the job done. 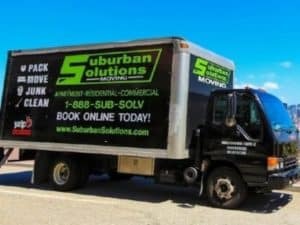 A moving company in Philadelphia PA such as ours uses this equipment to complete moves efficiently and quickly. When the going gets tough during moving, you can still stop and contact a moving company in Philadelphia PA to take over. There may be many tasks on your plate to accomplish regarding the move that letting professionals do the hauling for you could be the right decision.